The Ethnic Dance Festival is 33 years old this year. 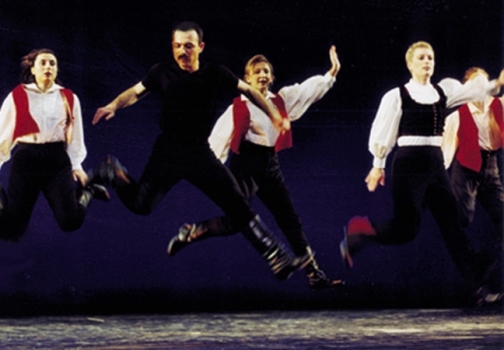 In 1978 when it began it was held in various community venues around town and included just four or five groups who represented the strongest ethnic populations—i.e., Latinos (from many countries); Chinese; and a few Western European groups who participated in international folk dances. Today, there are groups from 24 countries, some soloists and a special tribute to the Ohlone people, who are, after all, the only real “natives” of the San Francisco Bay Area. Performances were held at UC Berkeley’s Zellerbach Hall for the first weekend, followed by outdoor festivities at San Franciso’s City Hall, Yerba Buena Gardens and at the Forum as well as the Novellus Theater at Yerba Buena Center for the Arts. Sponsored by World Arts West (Julie Mushet, Executive Director), the Ethnic Dance Festival has clearly become a series of major production events. As such, the actual performances are both more exciting and professional, especially in their technical aspects as well as the size of casts, the elaborate nature of costumes and the level of sound. When EDF performed at the Palace of Fine Arts, a larger venue in the northwestern section of the city, some of these aspects were absorbed in the larger house and stage space. At the Novellus, which as a small house and stage, they were more than a bit overwhelming. Of the ten groups presenting on June 25, I found three most intriguing: Barangay Dance Company (San Francisco-based Filipino ensemble); Chuna McIntyre of Nunamta Yup’ik Eskimo Singers and Dancers; and the Collage Dance Ensemble, from Transylvania, Hungary and Romania. The Barangay Dance Company presented “People of the Current” referring to the Tausug, an Isamic tribal group who dive for pearls in the China and Celebes Seas. Barangay was a large boat that carried Malay families to the Philippines. Using paddles, the older men established the boat actions while young men took jumps and belly falls to illustrate pearl diving. The women work colorful skirts, which were used as head cover, waistbands, blankets or flags.They moved in and out of the men’s more active actions, walking with flat feet and hand gestures that recall their Buddhist tradition. “People of the Current” was evocative, charming and enlightening of its culture. It is rare to see the Inuit-Eskimo tradition on stage. In “Take You on a Journey,” Chuna McIntyre, a Central Yup’ik Eskimo from Kushokwim Bay on the Bering Sea, offered a series of songs and a shuffle-like dances. He wore a Yup’ik mask and garments and played a tambourine-like instrument, the “cauyaq.” Dressed in the furs of his region, he and musician Vernon Chimegairea evoked the journey “in the air, on the ground and in your mind” that keeps the Yup’ik tradition alive. His was a unique and unusual offering. “Eastern Tides,” performed by the Collage Dance Ensemble of 16 dancers, was the most rhythmically exciting and intricate ensemble of the evening. Their tradition is Romani, a gypsy culture from Transylvania. The men dominate this dancing, entering as a squadron with steps that seem to recall horse-riding actions, clippity-clop foot sounds and high knees. They also use Hungarian boot slapping and claps. In contrast, the second section was danced to a sorrowful Roma style song, “Fani.” Women wearing multi-colored skirts join the men in round dances and delightful geometric patterns. Ahmet Luleci is the accomplished artistic director and choreographer. Kyoungil Ong from Korea and Oreet, a belly dancer, gave solo numbers, neither of which were sufficiently clear to make an impact, although their costumes were captivating. The Murphy Irish Dance Company filled the stage with children of every size doing traditional step dancing. The piece was enlivened by two young men (Anthony Sheridan and Evan Trudell) whose footwork outshone most classically trained ballet dancers. Alas, who can resist small children on stage? Young people also added zest to the Nimely Pan African Dance Company from Liberia, choreographed by Nimely Napala from the Boimah Gibla of the Liberian National Culture Troupe. Natyalaya, a women’s group trained in a style of dance from India, and Los Lupeños de San José added to the program’s lively cultural mix. The finale, to loud and persistent drumming, was brought to a close by Te Mana O Te Ra from Tahiti, Polynesia. The large company of men and women wore the traditional “grass skirts” made of fresh greenery, natural fibers and fine leather work. Lisa Aguilar created the piece with drumming by Ray Aguilar. The hip circles, the fast-pounding feet and the sound brought the program’s companies from the stage through the house as the audiences accompanied the exit with its applause and tributes. In these days of “spectaculars,” the EDF show accomplishes in size and color what makes audiences stand and cheer. This viewer, a frequent attendee at the festival over many years, would like to see less emphasis on production values, more accomplished soloists (if any are chosen) and care in the traditional values of community among dancers that could be so well represented if spectacular show-biz was not a primary emphasis.